An exciting holiday to Vietnam in December with Danang City will leave visitors surprise : The first winter festival is held at Ba Na Hills (Da Nang). 25 km to the southwest of Da Nang at an altitude of 1,487m, Sun World Ba Na Hills are considered as “One temperate place in the tropical forest” because the climate is cool all the year round and you can enjoy four seasons within a single day. From 11/25 - 12/21/2017, "the Winter Festival" with topics " Colors Winter" was first held at the Sun World in Ba Na Hills. The festival will bring visitors to the unique winter experience never before. The main color of the Christmas season will welcome visitors from the foot of the mountain to the top of Ba Na. At the entrance, tourists will be welcomed by colorfully-decorated Christmas trees, in such a cozy atmosphere. At Du Dôme square, get surprised with the highest Christmas tree with the most glorious decorations. Take your selfies under the lovely poinsettias and ornaments. The musical with the Snow Queen, Santa Claus and the reindeers is just one of the highlights of the show in the background of beautiful palaces in Ba Na Hills. 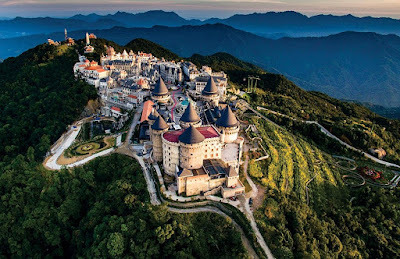 So, Discover Ba Na Hills at the Winter Festival will be a great trip and memorable for you travelers.